Whatever you think you know about Emily Dickinson will either be confirmed or completely recalculated after seeing the Court Theatre production of The Belle of Amherst, playing now through December 3. Playwright William Luce captures Dickinson’s mood and thought processes, nearly one hundred years after her death, with his purposefully meandering 1976 script. Rather than follow a linear timeline, the story takes the audience on a series of adventures—or, sometimes, misadventures—from different points in Dickinson’s life. Over the course of a day, while Dickinson bakes her favorite black cake, she recollects memory after memory, each lending itself to the next. Kate Fry, who plays Emily Dickinson, brilliantly gives the poet life, pulling in the audience immediately with a subtle peek through the fourth wall. She acknowledges we are in fact present, giving an informal invitation of sorts into her home. Once inside, we become readers of her poetry by sharing in her day-to-day intricate family dynamics, the gossip of neighbors, the pain of unrequited love, her work’s rejection by an esteemed critic, and even a few favorite baking recipes. Sometimes we are given the information by ordinary dialogue, but often the stories are woven together from the words from Dickinson’s actual poems. Fry not only carries the whole show—she is the whole show. Except for one brief intermission, Fry alone commands the stage the entire production. Even as the audience knows it is watching a one-woman show, Fry is so expert in her craft that there are moments when it is within reason to expect Dickinson’s sister, father, or any other person from her life to bolt down the stairs or in through the front door. The work displays Dickinson’s wit as well as her rebellion, and cloaks her reclusive nature in power rather than shrouding it in pity. 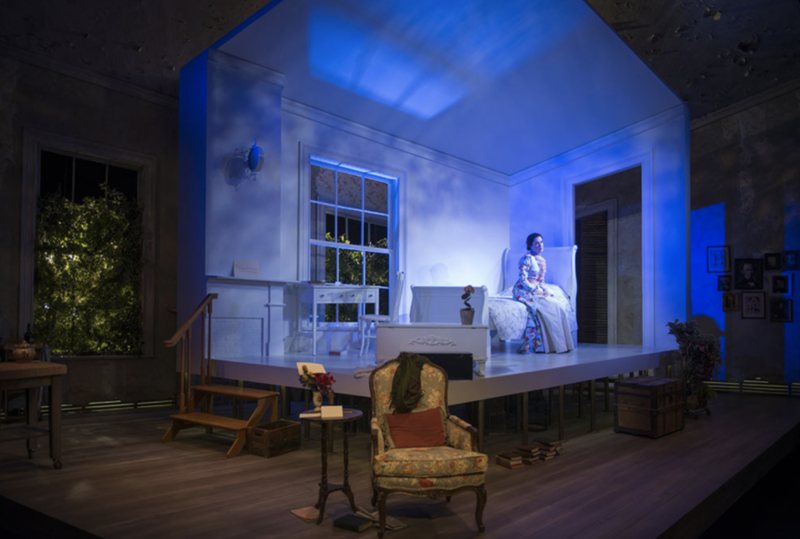 The play contemplates the roles, choices, and belief systems available for women in nineteenth-century Massachusetts, leaving room to quietly consider how Dickinson’s work as a poet may have flourished during her lifetime had she been a man like her contemporary Walt Whitman. Anyone already a fan of Emily Dickinson—appreciating her love for words, her say-it-like-she-saw-it poetry, and her choice to make choices different from the ones offered to the women of her time—will leave the production an even bigger fan. Anyone not previously a Dickinson fan—perhaps considering her a sullen spinster sitting in her room all day writing poems to stuff in a chest—will see demonstrations of her passion for life, her childlike wonder, her hints about the depths of the different loves of her life, and, most assuredly, her commitment and dedication to her work. Who knows, fandom may rise in you, like the sun—one ribbon at a time.